The report says despite all its achievements, Indian agriculture is still grappling with challenges like high monsoon dependency, unpredictable weather patterns, reduction in arable land, low per hectare yield, lower farmer incomes, etc. Inadequate crop protection measures and storage and transportation facilities are taking a heavy toll on the income realisation efforts of Indian farmers, says a knowledge paper prepared by industry body Ficci and advisory firm Tata Strategic Management Group. The report called for introduction of better crop protection solutions to shield the crop and produce from pests and increasing farm productivity. Titled 'Doubling Farmers' Income: Role of Crop Protection Chemicals & Solutions', the report, released in Delhi on July 12, says that despite all its achievements, Indian agriculture is still grappling with challenges like high monsoon dependency, unpredictable weather patterns, reduction in arable land, low per hectare yield, increase in pest attacks, lower farmer incomes, etc. Stating that approximately 25 percent of the global crop output is lost due to attacks by pests, weeds and diseases, the report emphasised the role of agrochemicals to enhance crop productivity. "Even though India has doubled its per hectare yield in the past decades it continues to be lower than the peer economies. Farmers in India continue to face challenges like lack of irrigation facilities, depleting water table levels, fragmentation of land, lack of scientific knowledge in farming, etc", it points out. According to the report, one of the gravest problems faced by Indian farmers is low income levels. "The yearly average income earned by an Indian farmer is close to $ 1,800 as compared to USA's $ 119,880, UK's $ 50,365 and Japan's $5,000. There are several factors that have dented the farmer's income which includes small land holdings, lack of availability of irrigation facilities and over dependence on monsoon, low consumption of pesticides and scanty crop yield. Farmers lose a significant part of their income as their crop and produce are attacked by pests and weeds". The report also points out that India's per hectare consumption of pesticides is significantly lower than countries with high yield. "The per hectare consumption in India is 0.6 kg as compared to China's 17 kg, Japan's 12.5 kg, Germany's 3.7 kg, France's 3.7 kg and UK's 2.8 kg. Therefore, the crops get affected by pests at various stages in the farming value chain including pre-harvest and during harvest. As the productivity is directly hampered due to pests and weeds, it affects the income levels of farmers. It is essential to protect not only the crop but also the produce as on an average 25% of the yield is destroyed during storage and transportation", it states. 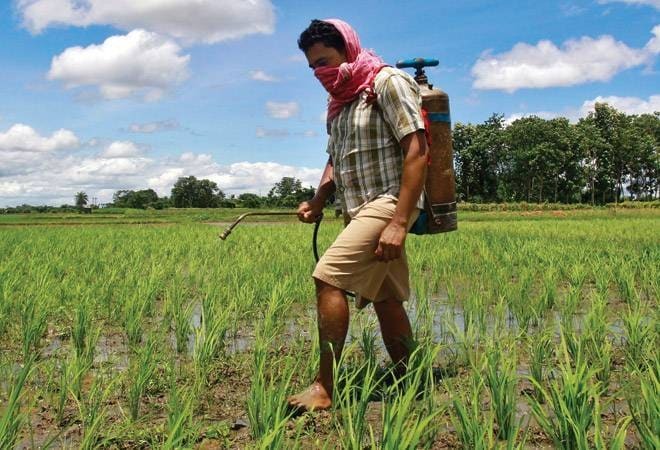 After the US, Japan and China, India is the fourth largest producer of agrochemicals. It's valued at $4.1 billion and is expected to grow at 8.3 percent to reach $ 8.1 billion by 2025. Agriculture employs nearly half of India's workforce and contributes about 17 percent to the nation's GDP.